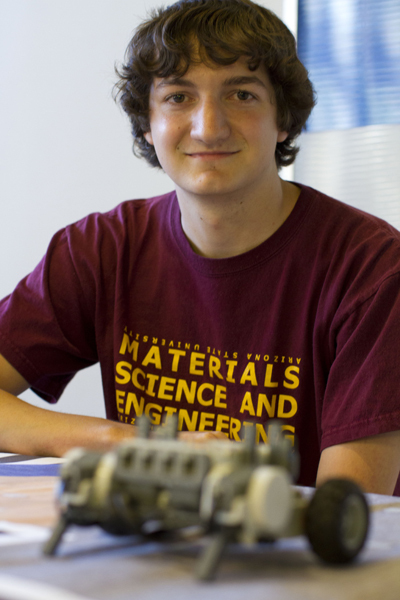 Reed Wittman, senior in materials science and engineering at ASU, competed in FLL and now volunteers and mentors teams. The Ira A. Fulton Schools of Engineering has sponsored the Arizona FIRST LEGO League since 2008. The number of teams competing continues to grow at a rapid rate with over 300 teams participating in the program statewide. The state championship tournament will be held on December 8. The event brings several hundred students, along with parents, mentors and supporters to ASU’s Tempe campus for a day of exciting robot games and presentations. Volunteers help make the event such a success – and are a large part of why Arizona’s participation continues to outpace national growth rates for the program. Be a part of this year’s event at the qualifying or championship tournaments. Join us in the effort to spark excitement in science, technology, engineering and math. A creative and motivated, 10-year-old, Reed Wittman had no idea how far his initial involvement in FIRST LEGO League (FLL) as a 5th grader would take him. He didn’t know FLL would follow him as he moved from one state to another in his youth. He didn’t know that he would end up dedicating around 1,800 hours to FLL through his involvement in 20 different FLL tournaments over the course of 12 years. He didn’t know his involvement in FLL would be not only as a young and eager participant, but as a patient and experienced volunteer and mentor. He definitely didn’t know that his interest sparked at age 10 would lead to winning a state FLL tournament in Arizona and honorable mentions at nationals in Atlanta, Ga.
Perhaps even more remarkable, he didn’t know that FLL would lead him to finding not only what he wanted to study, but where he wanted to study. Now a senior in materials science and engineering at Arizona State University, Reed says that he didn’t know that the skills he learned on all those long LEGO-filled Saturdays would follow and help him through 11 years of scholastic studies. But what Reed did know, is that FLL was a lot of fun. Now in his senior year of engineering studies, Reed reflects on just how much his start at FLL has impacted his life. It’s no exaggeration when he says, “FLL is the reason I am where I am.” FLL helped solidify a desire to excel in math and science at a young age. This desire led him to the exploration of many universities and programs of study. FLL was a game-changer when as a senior in high school Reed was exploring out-of-state schools and diverse degrees programs. It was an FLL tournament during this restless time that first introduced Reed to ASU’s campus and the opportunities there. It was on this trip that he first heard of the field of materials science and engineering. Along with influencing where and what he has studied, FLL affected how he would study. “FLL has long-lasting effects on young minds. It gave me a desire to solve problems and to think critically. It taught me how to come up with viable solutions, how to work with others and the amazing things that can happen when many things can be brought together at the same time,” he says. Most of all, Reed remembers how FLL has helped him to create so much more than robots.